The professional teeth whitening treatments offered by dentists are NOT the same as those used within beauty salons and day spa’s. These rudimentary systems are carried out on customers without any initial examination and diagnosis. Salon Whitening Systems use a much lower concentration and tend to only dry teeth out, making them whiter until they rehydrate and return to their original colour in just a few hours. Salon Take Home Systems use a very crude, generic mouth tray to apply the bleach, causing wastage of whitening gel and gum burn. Dentist Administered Home Systems include a Custom Made mouth Tray that fits snugly over your teeth, protecting the gums and ensuring direct contact of the gel, where it should be, on the teeth, not the gums. During In Office Dentist Administered Teeth Whitening treatments, the gums and oral tissues are protected against the bleach from causing painful burns inside the mouth and also against UV-A emitting lights which can cause sunburn of the oral soft tissues, as opposed to salon systems. Also, you have the added confidence of having a professional on hand for followup or and questions you may have. Contact our Toorak Dental Office book online. 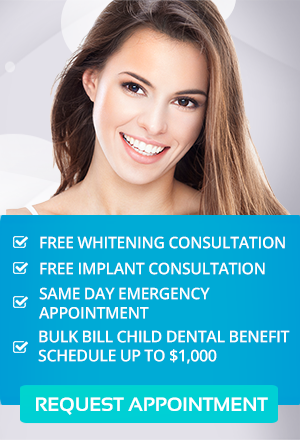 To claim your FREE Teeth Whitening consultation call us on (03) 9826 2220 or book online Today!